If you have read my blog before you will know painting in hot wax is my passion. You may also have read I love a painting challenge! Painting in hot wax can be a challenge in itself, getting the wax to flow as I want it to, to create the picture I want to achieve can be a challenge at time, so painting tiny as you can imagine is even more of a challenge. 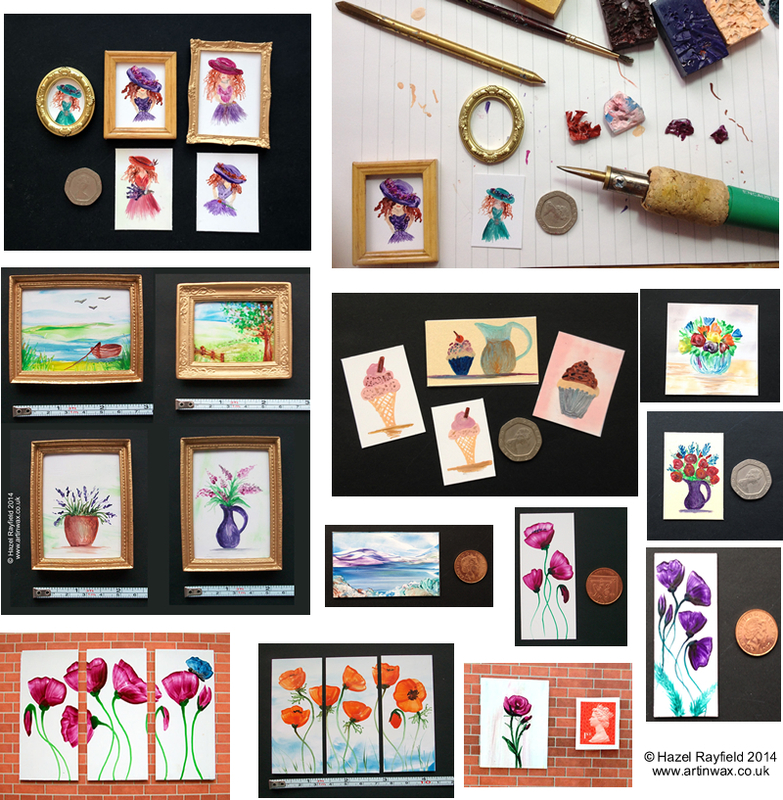 I have been painting small works of art, ACEO and ATC size for a couple of years now, these pictures are sized 3.5 x 2.5 inches and have proved very popular, I have sold many, here in the UK, some are also in Europe and the US. More recently, following a commission request to create some paintings in miniature for a DollHouse (which I blogged about Original Dolls’ House Art) I have have now created an online shop to show and sell some very tiny original encaustic art pictures, sized as small as 2 x 1.5 inches. 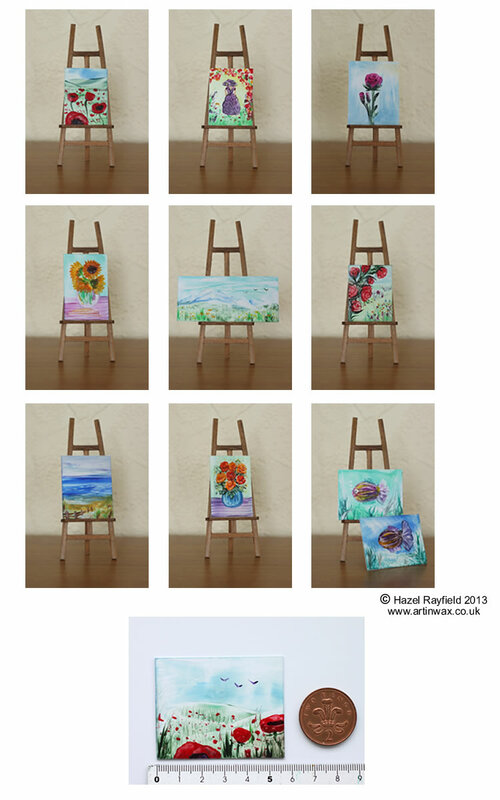 These are some of the most recent paintings now online, the subjects vary from Landscapes and seascapes, to a poppy meadow, a Lady in a garden, to vases of oranges roses and yellow sunflowers, from my classic pink roses to funky tropical fish. I have also just completed another commission for a miniature collectors project, so if you would like to commission a piece at a specific size and subject matter please contact me for details. I Love a challenge so when I was asked if I could paint some original paintings for a Dolls House I took the commission without a second thought! The Dolls House owner already has a mounted 10 x 8 painting of mine, a waterfall Landscape and she asked if I could paint some pictures for her new Doll House, which is a Georgian style dolls’ house. She wanted 6 paintings to fit into frames she had already purchased, so the pictures have all been painted to fit the frames sized 50mm x 40mm. The brief was to paint six paintings, in my Art In Wax style to suit different rooms in the house, with one or two colour requirements but no specific subjects. 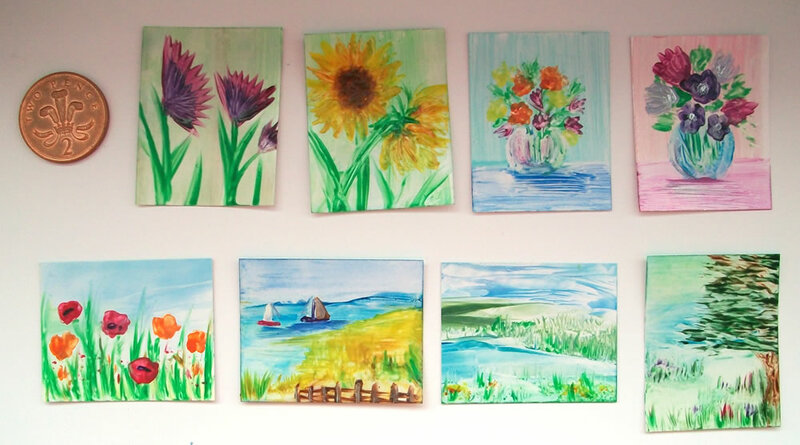 So I looked at some of my favorite Art In Wax paintings, Sunflowers, Meadows, Flower vases of course, these are my most popular painitngs and always sell well, and came up with the selection below. I have painted eight in total so she has the choice. The flower vases will suit the bedroom and lady’s dressing room, as specified in the Lilac and Pink tones, The Landscapes for the sitting room and the others for the hall way and study etc. If you would like to commission a piece of original art for your Dolls House, please contact me for details. 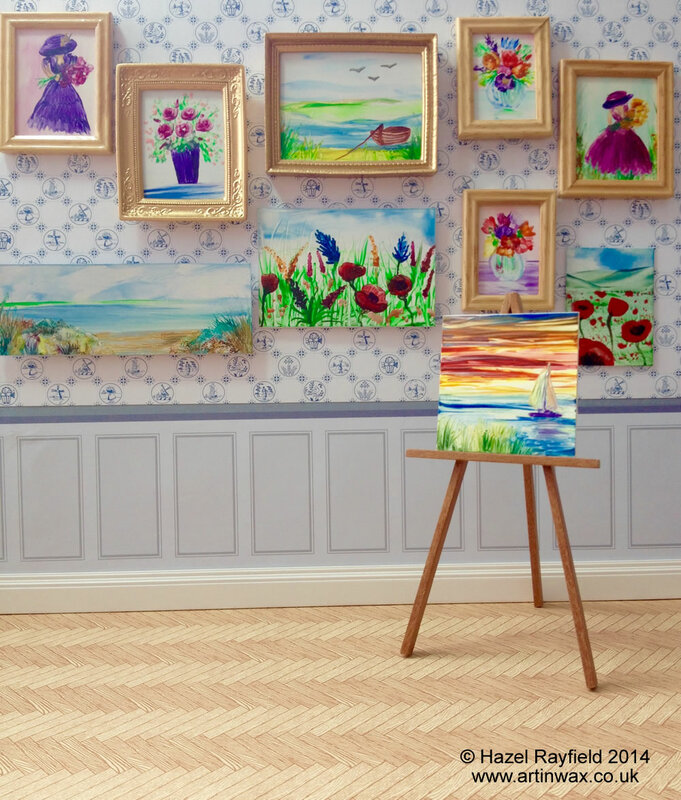 Maybe you would like to have a painting created especially for your Dolls House and have a piece of Art In Wax for your own walls too – wouldn’t that be fun, A vase of flowers on your wall and a similar miniature in your Dolls House?